The Cuckoo's Nest and What You Hustlin' Brother? 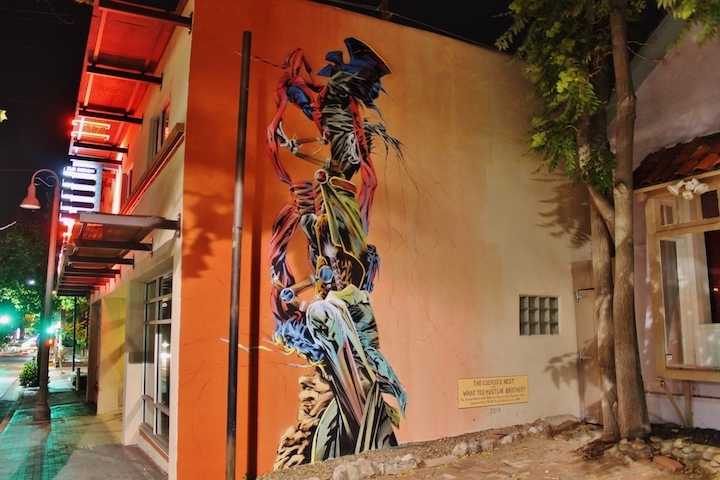 Aaron Noble collaborated with Faustino Villa and Roberto Reyes in creating this spray paint and brush mural that is illustrated from collaged comic book pieces. Inspired by comic book imagery, Aaron Noble's paintings incorporate superhero body parts morphed, stretched and free floating in a "negative space" landscape. He is known in San Francisco for his earlier WPA-styled outdoor murals depicting the city's labor history. Now his interests involve contemporary popular street culture, Western comic art, Japanese anime and manga, video games, and technology.